The Study in Kyoto and Bogor Fair invited local students to learn and consult about undergraduate and graduate programs at Kyoto University and Bogor Agricultural University (IPB), academic scholarships and student life in Kyoto. 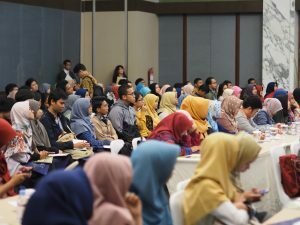 Although held as a side event to the Symposium, the event gained major proportions, attracting nearly 200 prospective students to the symposium venue to be addressed by Kyoto University President Juichi Yamagiwa and by representatives of many of the graduate and undergraduate programs at both universities as well as the Japanese Embassy in Indonesia, JASSO, and the International Cooperation Office of IPB. 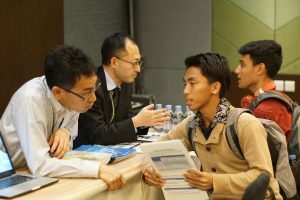 Students listened attentively to the presentations and many took the opportunity to visit individual booths nearby for further consultations with faculty and with current Indonesian and international students now studying at Kyoto University. Among the faculty attending to the students were five graduate school deans (Global Environmental Studies, Agriculture, Engineering, Human and Environmental Studies and Asia and Africa Area Studies), joined by faculty and staff who explained about the undergraduate International Course in Civil Engineering and the new Kyoto International Undergraduate Program (Kyoto iUP). The presentation schedule concluded on a high note with a special drawing, assisted by Kyoto University Vice President Kayo Inaba and Dr. Dase Hunaefi and Dr. Ernan Rustiadi, Head of Study Program　of　IPB, that awarded 20 lucky students with Kyoto University and IPB brand goods.